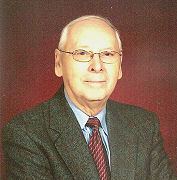 Laurent Gousie began his college teaching career at Providence College in September 1960 as an instructor of Intermediate French. His career at PC spanned 50 years, retiring in June of 2009. While teaching at PC, he continued his studies at Harvard University, where he received a Master of Arts degree in Modern German Literature in 1965. He was later appointed Coordinator of Study Abroad, a position that he held for 25 years. Between 1967 and 1970, Dr. Gousie served as the Resident Director of the Study Abroad Program in Fribourg, Switzerland. While there, he completed the requirements for his doctorate in Modern German Literature, with minors in German Philology and French Literature. During the 1970s and 80s, Dr. Gousie continued to move up the career ladder. He was appointed Assistant Dean of the Undergraduate School. In that capacity he developed a semester exam schedule that was used for more than 20 years. He was later appointed the Registrar for all schools at Providence College. His accomplishments in that position include the initiation of a telephone and online registration system, and the creation of an automated degree audit transcript that enables advisors and department chairs to determine whether a student has met all of the requirements for graduation. Dr. Gousie served as the Associate Vice President for Academic Records, was a member of the college planning committee, and served on the committee which developed and introduced the Western Civilization Program at Providence College. While serving as a tenured professor at PC, Dr. Gousie also achieved a distinguished military career. He served more than three years on active duty in the U.S. Army as part of the occupation forces in Germany, and remained there after in the Army Reserve for more than 33 years. He has the distinction of moving through each of the enlisted and officer ranks. He enlisted as a private first class and reached the level of sergeant major. He then received a direct commission as a second lieutenant. He continued to rise through the officer ranks, and retired as a colonel. As an officer, Gousie held many positions, including commander of an infantry training battalion, and commander of a major training unit. He also commanded an active duty exercise training 600 recruits for service as infantry soldiers. This was a ten week experimental program supervised by the highest levels of the Department of the Army. He is the recipient of several service medals, ribbons and awards including the Legion of Merit, which is the highest non-combat award for meritorious military service..